YFC Camp this past summer was a week full of excitement, energy, and never-ending craziness with hundreds of teens, and I was already worn out going into it. After spending the last few days celebrating my grandfather’s life with my family, I was emotionally and physically drained. I walked off of the plane knowing that I only had a few hours left to repack before leaving for camp. A part of me wanted to back out, but deep inside something told me that I needed to go. That’s where I met “Tyler.” A few days into the week I noticed he seemed down. What followed was an hour-long, painfully vulnerable and emotionally-charged conversation as he shared his story with me. As we continued with our week at camp, I began to understand why I felt drawn to be there. 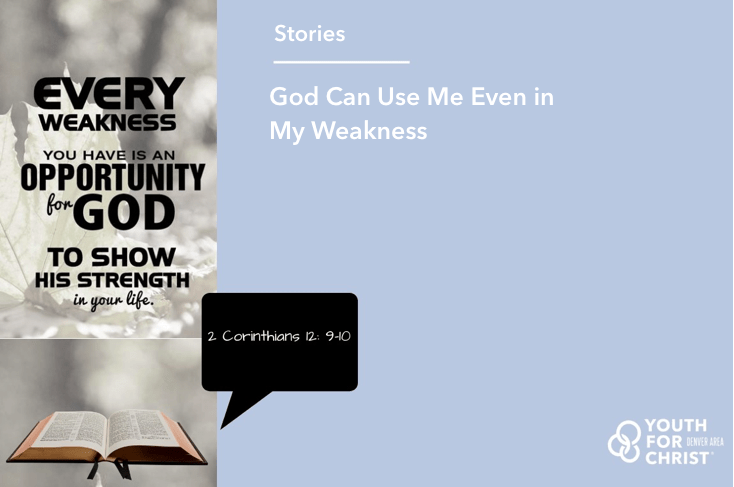 God continues to show me that he can use me even in my weakness. Thank you for being a part of the ongoing conversations with youth like Tyler in our city and helping us to share God’s story. It’s our honor to be the storytellers on your behalf who meet kids right where they are and give life to their story. Providing young people in our community with the opportunity to make an informed decision to be a follower of Jesus Christ and become part of a local church.